Looking for a way to prepare healthy meals quickly using easy-to-find, inexpensive ingredients? Need help planning ahead for what meals to prepare when? Hoping for new recipe ideas and inspiration? 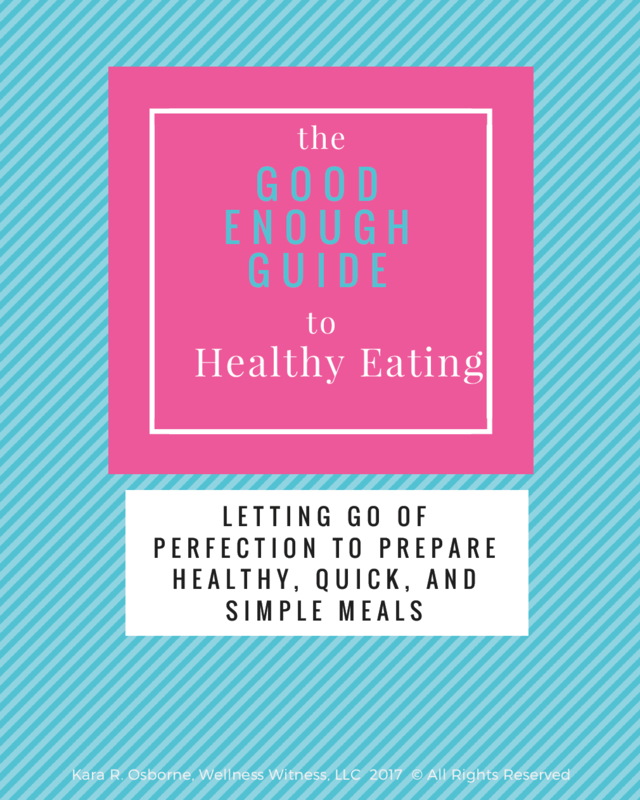 Introducing: THE GOOD ENOUGH GUIDE to Healthy Eating: Letting go of Perfection to Prepare Healthy, Quick, and Simple Meals. want to feed their family healthy meals but don’t have a lot of extra time for complicated recipes. want to learn to meal prep ahead of time so that meals can be ready quickly. are tired of staring into the pantry at 6 p.m. and wondering what in the world you can prepare for dinner. don’t desire complicated recipes or expensive ingredients. are ready to let go of perfection and instead learn to focus on sustainable healthy living habits in your daily lives. A 4-week plan that gives your suggestions and guidance on what meals to prepare each evening for supper and includes healthy recipes. These recipes are based around Protein and Produce and can be easily modified to fit individualized dietary needs. Most of the meals can be prepared both gluten-free and dairy free. Ideas for healthy breakfasts, lunches, and even snacks including recipes. A section of how to begin a meal-prep practice of your own each week. A PREP AHEAD section for things you can do on the weekend to make your weekday meals even quicker to prepare. Nutritional teaching documents on topics such as: Pre-emptive eating strategies, Balancing your HEC, choosing the best pre-packaged snack options, and more. Please note: I am NOT a certified nutritionist and make no claims as to the contrary. Each individual’s dietary needs and restrictions are unique to the individual. This guide is produced for informational purposes only. Statements within this guide have not been evaluated or approved by the Food and Drug Administration. This guide is not intended to diagnose, treat, cure, or prevent any disease. Content should not be considered a substitute for professional medical expertise or treatment. The reader assumes full responsibility for consulting a qualified health professional regarding health conditions or concerns, and before starting a new diet or health program. The writer of this guide is not responsible for adverse reactions, effects, or consequences resulting from the use of any recipes or suggestions herein or procedures undertaken after. Is this a digital download, an ebook, or a product that will be mailed to me? This is a .pdf file that will be delivered electronically immediately after purchase. If you have any issues at all accessing your copy after checkout, you can contact me at: kara@wellnesswitness.com and we'll get you taken care of! Will this be a bite-by-bite meal plan that will tell me exactly what to eat and when? No. Our approach to living a healthy, sustainable lifestyle is to implement healthier choices and allowing the Lord to help us steward our bodies well for His glory. This guide is simply a tool to help you determine better choices, to get a meal plan in place, and to begin to see how simple it can be to feed your family well. I'm dairy free and/or gluten free. Can this meal guide still help me? Absolutely! Almost all of the meal ideas included can be easily modified or adapted to be gluten free and/or dairy free. Does this guide contain nutrition information for each recipe including calories, protein, carbohydrates, and fiber? No. Again- the Wellness Witness approach isn't centered around calorie counting or macro counting. Simply fueling our bodies with foods that the Lord made. For the most part, each recipe is centered around two main things: protein and produce. Are these recipes unique to this guide or can I find them elsewhere on the Internet? Some of the recipes are found on the main Wellness Witness website. Others are unique to the guide. The main benefit of this product isn't necessarily the recipes (although they are great! ), it's the plan already put together for you giving you recommendations for what to prepare for your family's busy schedule. It eliminates the problem of standing in front of your pantry at 5:00 p.m. after a long day and wondering what in the world you can prepare for supper. Is this a high-fat, low carbohydrate plan? No, although some recipes may be higher in fat. Carbohydrates that are eaten are mainly in the form of fruits or vegetables, but some others are included as well. Here at Wellness Witness, we believe that no food is "bad" and we allow the Lord to show us what "good enough" looks like day by day.